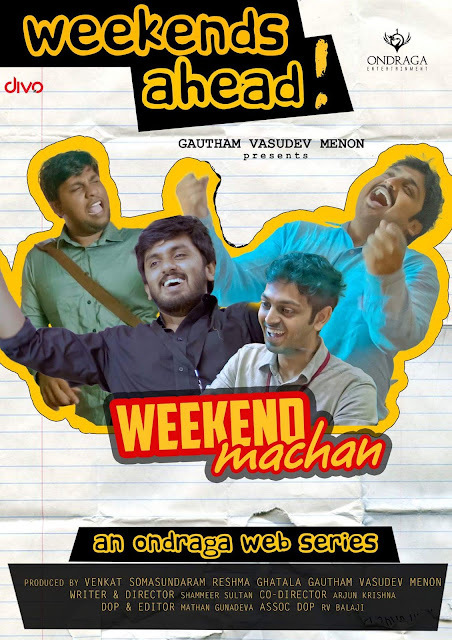 'Weekend Machan' series is directed by Shammeer Sultan, co-directed by Arjun Krishna, Cinematography and editing by Mathan Gunadeva. The teaser of "Weekend Machan" was launched on 10th September by director Gautham Vasudev Menon on the Ondraga entertainment YouTube channel. The first episode of the series is expected in October. This series is about a such weekend plans made by 4 bachelors who live together. Weekends with plans that come true, with plans that don't have a plan, things that happen without a plan and of course plans that go terribly wrong. But the best weekends are those that just fly and cannot be remembered on a Monday morning. And irrespective of how the weekend goes, the next weekend has to have another plan.